If you’re like most business owners, you need to sell something to your audience by getting on a discovery sales call. Today’s episode is the result of listener feedback. As I was going over survey responses and emails that I’ve gotten from listeners, I noticed a recurring theme. Over and over people would ask me about how I got better at selling over the phone since I was soooooooooo bad to start with. If you’re like most businesses out there, you’ve got a product, program, or service to sell over the phone. It’s the rare person who loves to spend all their time on discovery calls, so if that’s not your favorite part of running your business, welcome. You are in the right place. And, boy oh boy, do I get this pain. It was MY biggest pain when I first started my business. I was just kinda winging it trying to figure out how to sell myself and my services without being salesy. In fact, I’ve shared with you in a various episodes that a few years back, I had over 1,000 failed sales calls before I put my first marketing funnel into place, so when I tell you I KNOW how painful these calls can be, I’m speaking from experience. Once I truly understood the mistakes I was making, I rolled out a super simple discovery call marketing funnel, and within three weeks, I’d sold over $60,000 of services easily. I wasn’t salesy or pushy. I want to share some of the biggest mistakes that I made — and that you may be unintentionally making too. Mistakes that may make you feel like you or your business isn’t good enough when in reality, there is a process you can follow that could turn everything around for you like it did for me. After we go through the mistakes, we’ll jump into a five-point discovery call cheat sheet to help you run your calls like a pro AND have great client relationships. You may not believe it now, but when you use this cheat sheet to run your discovery calls, you’ll probably get to the point where you actually LOVE these calls. I never thought I would, but I definitely love these calls now. 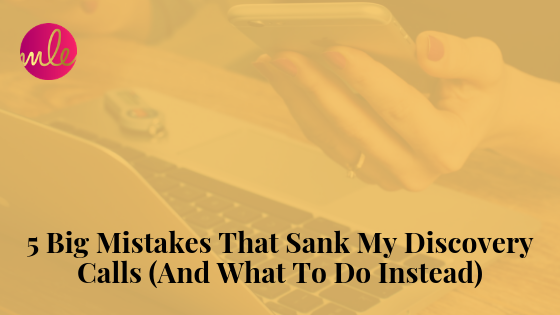 Let’s jump on into my countdown of the top five mistakes that can sink your discovery calls and how you can avoid them. Your discovery calls should not consist of you asking questions like this is some criminal interrogation. Most people who sign up for a discovery call actually WANT to get on the phone with you to uncover if you’re a good fit for what they want, and they’re happy to have a conversation with you. One time, I got on the phone with someone and was so nervous because I wanted to work with them so badly that I just started peppering them with question after question after question about their marketing. They kept answering with, “I don’t know,” and started getting defensive. In the end, the call left both of us feeling really badly. Asking the wrong questions can make someone feel incompetent and defensive because it feels like the Spanish Inquisition. A discovery call is a time where you ask questions because it’s so important to understand your potential client’s situation. Effective questions lead to a-has’ within the person you’re talking to, and DON’T make the person feel under attack. When you ask the right type of question at each step of the way, it makes a MASSIVE difference in your results. Your goal is to emotionally engage them and not just ask questions to selfishly get information. That approach will not build rapport with your potential clients. They want to know if you can help them, understand them and if you have something that will help them achieve their goals faster, easier, and less expensively than if they try to figure it out on their own. Bottom line: They’ve got a problem to solve, AND they want to know if you’re the one who can help them. If you get on a call with someone, and you’re too broad with all the skills you bring to the table, you won’t be working together. NO ONE wants to hire you if you’re too broad and general. That’s uncomfortable and nebulous, and it’s hard to put a value on you if you’re too broad. People want to buy from you because you help them SOLVE A PROBLEM. Think about a great conversation you had with a business that left you thinking, “Yes, that person UNDERSTANDS me, and I know they will deliver!” My guess is that you had a discovery call that revolved around your situation plus how to solve it with some proof and stories sprinkled in. Bottom line: If you can’t offer value during your discovery call, you’re NOT making the sale. You’ve probably had it happen where someone reaches out to have a discovery call with you. You get it scheduled and then the time comes for your call, and they no-show you. I used to have 60+% of my calls no-show me, and it was SO frustrating…But it was totally my fault because I didn’t have a show-up process. Having a show-up process can help reduce no-shows. 1. Have people fill out an application. This will get people a bit more committed to the process. Even though it doesn’t cost them money, filling out an application costs time and info. That alone will have more committed people in your discovery call lineup. 2. Invest in an online booking system that has automatic reminders. Some systems you can look into are Calendly, Scheduleonce, and Acuity. I used to be afraid to have a plan for my sales calls because I wanted to be able to have an organic conversation and not be too salesy or pushy. I definitely had conversations — lots and lots of conversations that never moved beyond the chatting phase. Call planning may sound tedious and unnecessary but the truth is, when it’s done right, call planning can make both you and the people you speak with have really incredible sales calls that organically and enthusiastically lead both of you to the next step. When I started planning out my calls, I was able to ask questions that helped to build up their urgency to buy and their desire for the outcome — while building belief that I was the person who could help them do that. Take the time to pre-plan your call flow, and have a few questions in your back pocket ready to go. The American Marketing Association says that the average consumer is exposed to upwards of 10,000 brand messages EVERY SINGLE DAY. Your prospects are busy and overwhelmed and are all wondering if THIS will be the thing that will help them achieve their goal. You need to take control of the conversation and lead your prospects through a well-thought-out experience. Bottom line: If your conversation doesn’t quickly deliver a breakthrough a-ha and/or tremendous value to the person you’re speaking with, there will not be a follow-up meeting. No proposal. No second shot. The best way to control the conversation is with a proven discovery call checklist that will help you stay focused and on track. Before you ever talk about how long you’ve been in business, how many certifications, degrees and whatnot you have or even where you’re located. Before you ever talk about what your product or service does or drop your elevator pitch on them, follow this framework! I’ve put it together in a quick cheat sheet that you can download right here. Emotionally connect to what their problem is costing them right now. Paint a picture of a better tomorrow. Prove you have done it before.